Arm In Arm, the Trenton-based nonprofit organization, raised more than $90,000 at its annual fall benefit in Princeton. The event, “Supporting Economic Mobility: The Bridge to Self-Sufficiency,” featured a cocktail reception and silent auction and convened an expert panel. Event sponsors were Johnson & Johnson, NJM, Accenture, and DiversityInc. 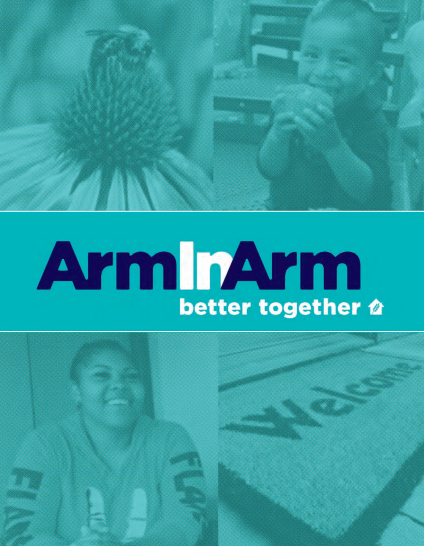 Arm In Arm, founded in 1980 as Crisis Ministry in a partnership between Trinity and Nassau Presbyterian churches in Princeton, where the organization started with a single food pantry. Now the organization has two additional food pantries in Trenton and has programs to prevent and alleviate housing instability, as well as workforce development initiatives to enhance economic and employment stability. The presentation and Q&A focused on an innovative model from Boston-based EMPath, which has been successful in helping families to move into financial stability and self-sufficiency. 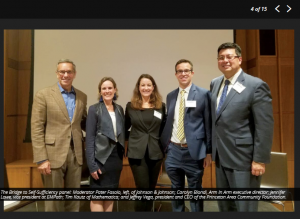 Bringing first-hand experience to the discussion were panelists Jeffrey Vega of Princeton Area Community Foundation; Jennifer Lowe of EMPath; and Tim Kautz of Mathematica Policy Research. The panel moderator was J&J’s Peter Fasolo, an Arm In Arm board member.